DESY scientist Dr. Rolf Bühler receives this year’s Shakti P. Duggal Award for astroparticle physics. Every two years, this prestigious prize is presented to young scientists not older than 36 years for outstanding contributions in the field of cosmic ray and astroparticle physics research. Bühler is honoured for a series of ingenious works based on data from cosmic gamma-ray observatories. With data from the "Fermi" space telescope, Bühler discovered that the crab nebula, the alleged standard candle of gamma-ray astronomy, is actually a variable source with short, but violent bursts of activity. With the telescopes of the H.E.S.S. ("High Energy Stereoscopic System") observatory in Namibia, he also analysed two highly variable phases of the active galaxy PKS 2155-304 and deduced limits for a possible energy dependence of the speed of light at very high photon energies, as predicted in some quantum gravitation models. Moreover, Bühler for the first time measured the density of the extragalactic background light over very long and so-called cosmological distances. It originates at the formation of stars or galaxies in outer space and leaves characteristic features in the spectra of faraway active galaxies, the so-called gamma-ray blazars. All these analyses required an outstanding intuition for the detectors used for the measurements, and Bühler carried them out and published them in a leading position. They provided all important results with a major influence that even goes beyond astroparticle physics. 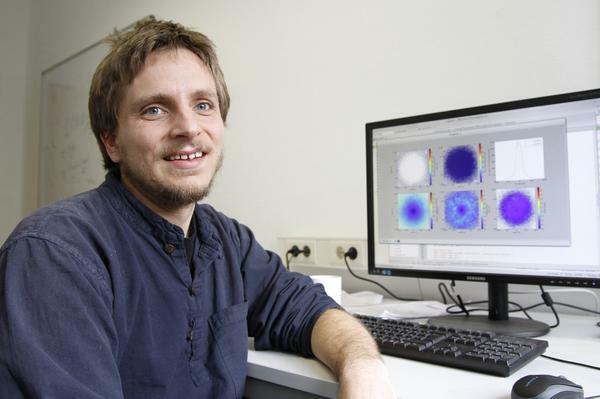 Bühler studied in Heidelberg and, in 2009, gained his Ph.D. at the Max Planck Institute of Nuclear Physics. After that, he spent three years at the Kavli Institute for Particle Astrophysics and Cosmology of Stanford University in California and worked on the analysis of data from the gamma-ray satellite “Fermi”. Since 2012, he is a research fellow at DESY in Zeuthen, where he continues to analyse “Fermi” data and participates in the building of the Cherenkov Telescope Array (CTA). The Shakti P. Duggal Award is conferred by an international jury and presented at the opening of the International Cosmic Ray Conference; this year on 2 July in Rio de Janeiro. The award is endowed with 1200 US dollars and includes an invitation to a colloquium at Bartol Research Institute of the University of Delaware. The namesake Shakti P. Duggal (1932-1982) was a physicist from India who for many years did research and teaching in the field of astroparticle physics. Astroparticle physics deals with high-energy processes in the universe, in which subatomic particles are accelerated to a higher speed than possible in an accelerator on earth. This process often generates energy-rich gamma rays and the fast cosmic particles and energy-rich gamma rays constantly rain down on the earth’s atmosphere as cosmic radiation.